Architecture students from London South Bank University (LSBU) have unveiled their unique hoarding design at Southbank Place after winning a competition to transform Sutton Walk in London. Last year, Muneeb Ali Khan and Daniel Tang were invited to create designs for an interactive hoarding at Southbank Place. Qatari Diar and Canary Wharf Group requested the LSBU students design a piece to showcase the prominence of the Shell Centre redevelopment in the heart of one of London’s most popular cultural districts. Working with the Southbank Place team and with the help of Professor Lilly Kudic, Head of Architecture at LSBU, Muneeb and Daniel produced a design that would reflect the positive impact this development will have on the local area, whilst catching pedestrians’ attention. 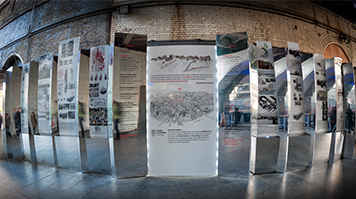 As winners of the hoarding design competition, Muneeb and Daniel produced a thought-provoking interactive design using inventive mirror angles that create an optical illusion to reflect life on London’s busy South Bank. Their design is scheduled to be on display until the end of the next academic year. This project was inspired by the 1963 film ‘A Look at Life’, which was released when the Shell Centre first opened and aims to engage with the local area and celebrate its evolution through the years. Find out about studying architecture at LSBU and more about the Southbank Place development.